Update, March 5: Epic will ban players who team up in solo game modes. The battle royale genre has two clear front-runners, but which is better – PUBG or Fortnite? With regards to the example below, Epic say they’ve already taken action against the players involved (who formed a five-person squad in the game’s solo mode). They also say that players can help out by reporting players using this online form. Original story, March 5:With 45 million players, anda peak player count of more than three million at any given moment, the odds of randomly matching with your friends in a solo game of Fortnite Battle Royale should be pretty slim, right? Wrong. A video posted on Reddit last night shows a player in solos come across five players working together. Unsurprisingly, being on the wrong end of a five on one disadvantage doesn’t pan out brilliantly, and the player is swiftly eliminated from the game. The unofficial team quickly loot their fallen foe, before continuing through their game. 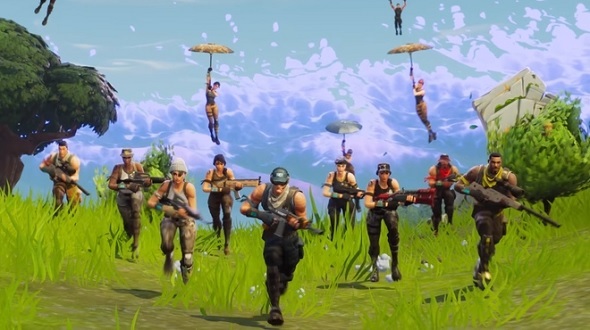 Unofficial squads, in which multiple players join the same game outside of the in-game Squad matchmaking, are something of a problem in battle royale games. PlayerUnknown’s Battlegrounds players reported finding 40-person squads, in a particularly egregious example of the practice. It’s not particularly difficult to do – pressing Launch at the same time offers a low-fi but reasonably effective method – but can have a big impact on the game. I attempted to replicate this with a group of friends last night, to find out how easy it really is to pull off. Despite living between 20 and 100 miles apart, we were able to join the same game on our second attempt, after a handful of attempts across both Squads and Solos, the five of us matched with at least one person roughly 50% of the time. The Reddit thread linked above provides a variety of potential ways to improve your odds, but that’s already an extremely high success rate for what should be nearly impossible odds. We’ve reached out to Epic for comment, and we’ll update this story with their response.